My daily routine begins in a multicultural neighbourhood located in the XVIII arrondissement in Paris, and ends in the place where I began my inspiring education experience this year, the Center for Research and Interdisciplinarity (CRI Paris), located in the heart of the city. Three metro stations (Sully Morland, Bastille, St.Paul) provide access to this utopian place that I associate with visionary people, enjoyable experiences and inspiring initiatives. To make my long journey short, I will focus on the last 300 m. that I walk from the Metro Sully-Morland (Exit Henri IV) to the CRI-Paris. Even in such a short distance, you can find hidden treasures- but only if you keep your eyes open! I see an unexpected tag on the wall. 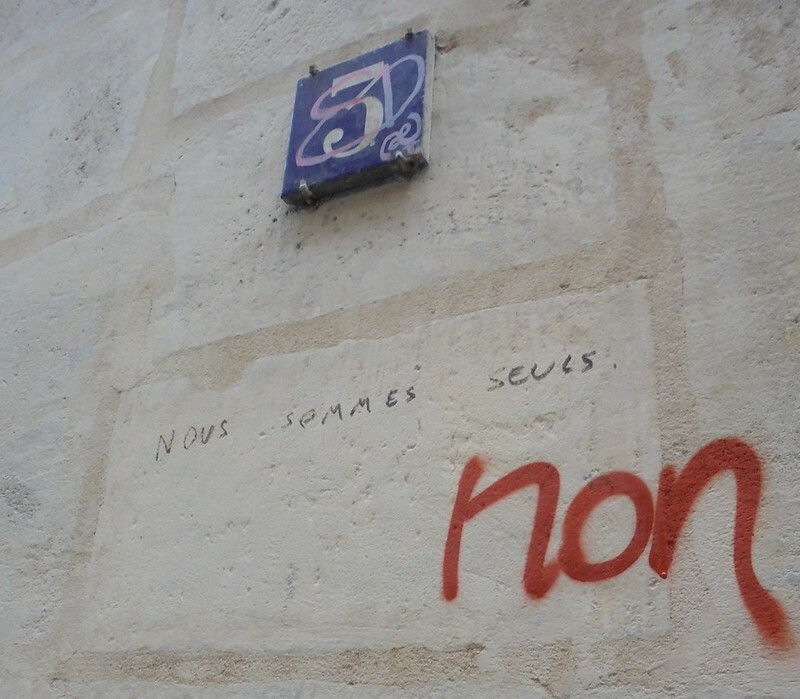 “Nous sommes seuls! -NON!” which translates to “We are alone! -NO!”. A short conversation between two people, one giving hope to another, leads me to reflect on loneliness, especially in big cities like Paris. I can see how the hectic pace of modern life and the difficulty of making new acquaintances in a big city, compelled someone to use this wall to communicate with strangers that pass by. A beautiful portrait of a young woman makes me look closer and discover the label of a creative Parisian agency named “Fantine & Simon”. I imagine myself in an open-air museum, these artifacts serving me a dose of culture as I walk to my school. 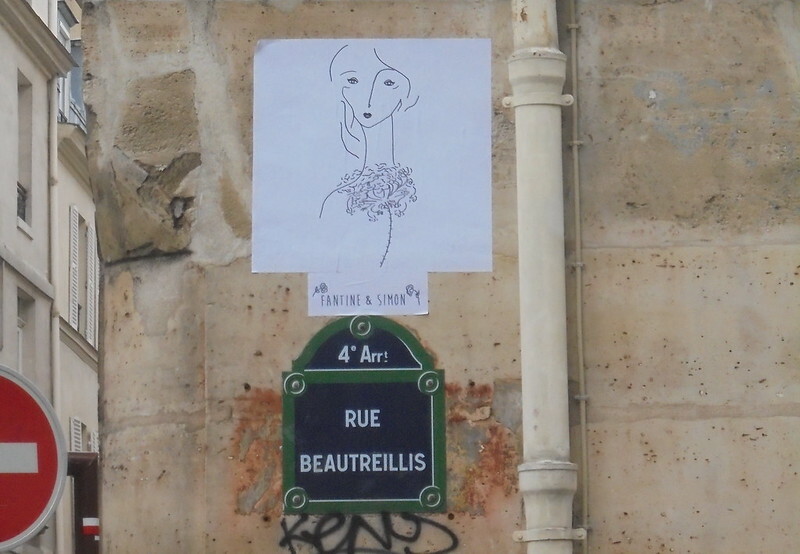 I am drawn to how Fantine & Simon view these portraits, as mini-exhibits to be found in different places around Paris. A visit to their website was enough to rewire my brain and gather inspiration for my day. Continuing my journey, I find unexpectedly an old portal and a clock surrounded by blocks of apartments. Searching the internet, I find that these remains are of great historic significance to Parisians, and formerly belonged to “Hotel Raoul”. Design elements from the time of Louis XV are incorporated into some of the iron balconies. It is alleged that the hotel’s former facade featured vivid stained glass windows and a garden with a statue and a small pond with red goldfishes. “Hotel Raoul” was built in 1810 and demolished in 1961. Several streets in the surrounding area of The Marais had to be widened and and aligned with the expectations set by the local planning agency, leading many of the ancient buildings of the area to be destroyed. 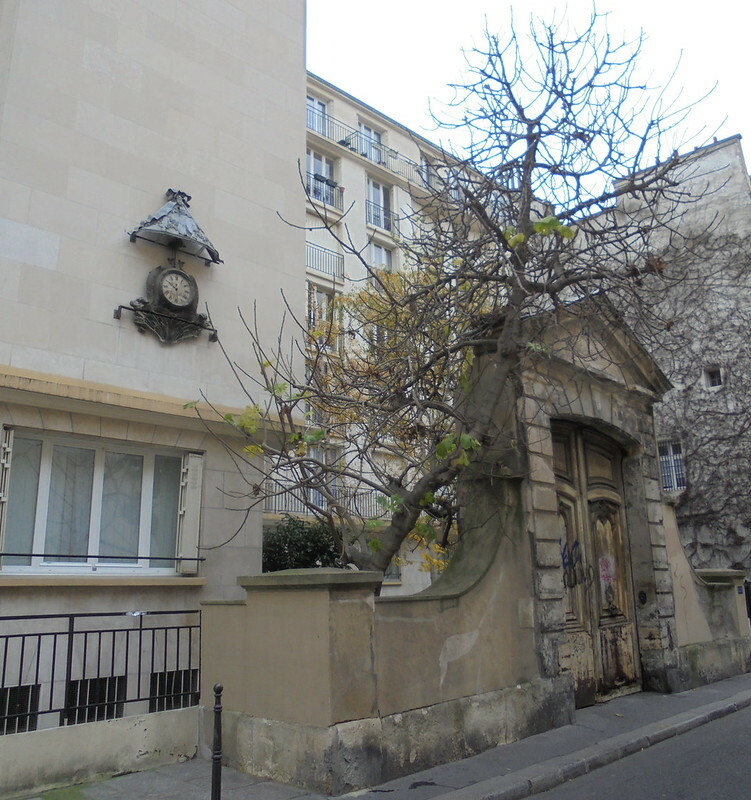 Interestingly, even though the complete destruction of the “Hotel Raoul” was decided officially in 1959, the architect in charge of the urban plan for The Marais eventually chose to conserve this front porch, as well as other similar artifacts on Beautreillis Street. There are several reports concerning this imposing entrance, and also a website, a commendable initiative to narrate the story of these ruins. I am always thrilled to find hidden historical artifacts like this one, especially in lively neighborhoods like The Marais. In order to stimulate my brain and spark my creativity, I continuously try to find ways to alter my daily walking path. To me, building sustainable cities begins with an appreciation of the beauty and history of the environment we live in (urban or rural), and the goodwill that brings people together. Post, images & map by Lamprini Chartofylaka, a Master EdTech student at the Center for Research and Interdisciplinarity (CRI Paris) at the University Paris V Descartes. Lamprini is an enthusiast driven by learning initiatives in cities, and her eternal love for Athens. Contact her at lamprini.chartofylaka@cri-paris.org. Discovery Walks is a blog series that challenges residents to actively use their senses to guide urban exploration. To submit a Discovery Walk from your city, check out this post. This series is curated by Insiyah Mohammad, a student at the Department of Urban Studies and Planning at MIT. Find her on twitter: @InsiyahMohd.